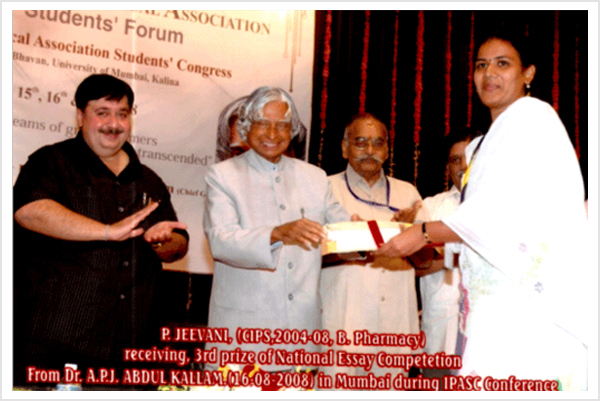 Guntur Lam, Chalapathi Institute of Pharmaceutical Sciences, (CIPS) B.Pharmacy Student Peddi Jeevani felicitated and awarded Third prize on 15th August-2008 at Mumbai by the Former President A.P.J.Abdul Kalam for the National Essay Competition held by Indian Pharmaceutical Association for the topic entitled “Pharmacy Education in India. Former president A.P.J.Abdul Kalam and Prof. B.Suresh, President, Pharmacy Council of India lauded the student for her mettle said Principal Prof.Rama Rao Nadendla to the press. In this context Sri Y.V.Anjaneyulu, President, Chalapathi Educational Society and CIPS staff admired the student.